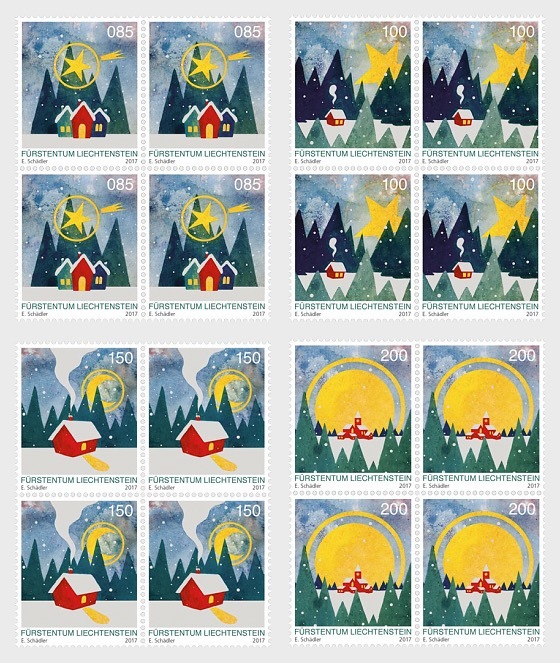 A design competition advertised among young Liechtenstein artists chose the motifs for the Christmas stamps of the next three issues. This year’s special stamps were designed by illustrator and storyteller Eliane Schädler. With her “Star of Bethlehem” (face value: CHF 0.85), “Winter Forest” (face value: CHF 1.00), “Moonshine” (face value: CHF 1.50) and “Church” (face value: CHF 2.00), she impressively portrays houses with warm glowing lights against cold and dark landscapes. By doing so, she is seeking to communicate the feelings evoked in her at the thought of Christmas to beholders, i.e. feelings of being safe, snug and content. Eliane Schädler painted the stamps in their original size in water colours, scanned them with high resolution and then further processed them digitally. Besides needing a very fine paintbrush, depicting scenes on such a small surface also requires that only the bare essentials are portrayed: simple shapes and clearcut surfaces. That is why she attached great importance to using vivid colours to convey the mood. By including white areas on the stamps, the artist creates a connection between the stamp to the usually white envelope which is often used in the pre-Christmas period.